We understand the importance of producing your final dissertation piece and the stress that may be involved and so we provide a totally reliable thesis binding service using high quality materials and techniques. The pages are over sewn for strength and durability and a hard bound cover is added in a washable cloth. We have a wide range of colours in accordance with your universities requirements. The thesis will be lettered on the spine with your name, the degree and the year of submission and any front board blocking you may require. Front board blocking is at no extra cost. The turnaround time is 24 to 48 hours and drop off and pick up times may be outside normal opening hours by arrangement. If a thesis is returned by post Royal Mail rates will apply. Please get in touch if you require any further advice or assistance. 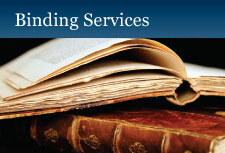 We offer a wide range of bespoke binding, repairs and restoration services.